The Full Real Life Nativity Creche Combine all figure sets with the stable and animals to complete the Real Life Nativity Creche. 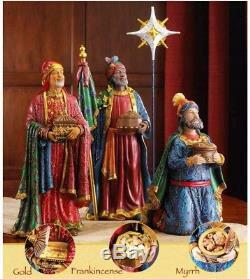 Figures with intricate detail and dramatic, life-like faces that capture the Christmas story. Each set comes with chests filled with real 23k gold and pure, authentic frankincense & myrrh from the same regions as the gifts brought 2000 years ago. The Full, Real Life Nativity includes all the figures, animals and lighted stable. 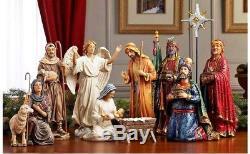 Real Life Nativity includes twelve 10 inch scale, meticulously hand painted sculpted figures. 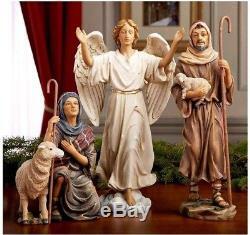 Standing Shepherd 9.5 inch, kneeling shepherd 6.5 inch and Angel stands 9.5 inches tall. Melchior (holds gold): 9.5 inch tall, Balthazar (holds frankincense): 10.5 inch tall, Caspar (holds myrrh): 7.25 inch kneeling, Christmas Star: 12.5 inch tall. 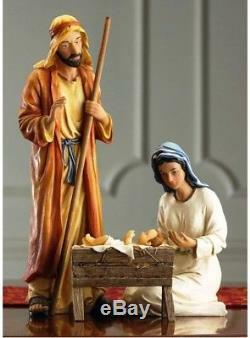 Joseph stands 9 inches tall, Mary is 6 inches; the manger is 2.5 inches high and Jesus is 2.75 inches long. 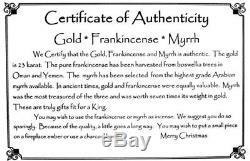 Includes real authentic Original Gifts of Christmas - Pure Frankincense, 23k Gold and Authentic Myrrh. The item "Christmas Nativity Set 10 inch Real Life Nativity Creche Set Baby Jesus Christ" is in sale since Monday, December 17, 2018. This item is in the category "Collectibles\Holiday & Seasonal\Christmas\ Current (1991-Now)\Nativity Items". The seller is "jdogchandler" and is located in Mesa, Arizona.